Truth has no meaning apart from God. Truth cannot be adequately explained, recognized, understood, or defined without God as the source. Since He alone is eternal and self-existent and He alone is the creator of all else, He is the fountain of all truth. If you don’t believe that, try defining truth without reference to God, and see how quickly all such definitions fail. The moment you begin to ponder the essence of truth, you are brought face-to-face with the requirement of a universal absolute—the eternal reality of God. Conversely, the whole concept of truth instantly becomes nonsense as soon as you attempt to remove the thought of God from your mind. There are serious moral implications, too, whenever someone tries to dissociate truth from the knowledge of God. Paul went on to write, “Just as they did not see fit to acknowledge God any longer, God gave them over to a depraved mind, to do those things which are not proper” (Roman 1:28). Abandon a biblical definition of truth, and unrighteousness is the inescapable result. We see it happening before our eyes in every corner of contemporary society. In fact, the widespread acceptance of homosexuality, rebellion, and all forms of iniquity that we see in our society today is a verbatim fulfillment of what Romans 1 says always happens when a society denies and suppresses the essential connection between God and truth. If you reflect on the subject with any degree of sobriety, you will soon see that even the most fundamental moral distinctions—good and evil, right and wrong, honor and dishonor—cannot possibly have any true or constant meaning apart from God. That is because truth and knowledge themselves simply have no coherent significance apart from a fixed source, namely, God. How could they? God embodies the very definition of truth. Every truth claim apart from Him is preposterous. In fact, human philosophers have sought for thousands of years to explain truth and account for human knowledge apart from God—and all who have tried have ultimately failed. That has led to an ominous shift in the world of secular thought in recent years. Here’s a thumbnail sketch of how the change came about: Ancient Greek philosophers simply assumed the validity of truth and human knowledge without attempting to account for how we know what we know. But about five hundred years before the time of Christ, Socrates, Plato, and Aristotle began to consider the problems of how to define knowledge, how to discover whether a belief is true, and how to determine whether we’re actually justified in believing anything. For some two thousand years, nearly all philosophers more or less presupposed that knowledge is conveyed somehow through nature, and they set forth a number of naturalistic explanations attempting to describe how truth and knowledge can be communicated to the human mind. Then in the middle of the seventeenth century, at the dawn of the so-called Enlightenment, philosophers such as René Descartes and John Locke began to grapple very seriously with the question of how we gain knowledge. That branch of philosophy became known as epistemology—the study of knowledge and how human minds apprehend truth. Descartes was a rationalist, believing that truth is known by reason, starting with a few foundational, self-evident truths and using logical deductions to build more sophisticated structures of knowledge on that foundation. Locke argued, instead, that the human mind begins as a blank slate and acquires knowledge purely through the senses. (Locke’s view is known as empiricism.) Immanuel Kant demonstrated that neither logic alone nor experience alone (hence neither rationalism nor empiricism) could account for all human knowledge, and he devised a view that combined elements of rationalism and empiricism. G. W. F. Hegel argued in turn that even Kant’s view was inadequate, and he proposed a more fluid view of truth, denying that reality is a constant. Instead, he said, what is true evolves and changes with the advancement of time. Hegel’s views opened the door to various kinds of irrationalism, represented by “modern” systems of thought ranging from the philosophies of Kierkegaard, Nietzche, and Marx to the pragmatism of Henry James. Elaborate epistemologies have thus been proposed and methodically debunked one after another—like a long chain in which every previous link is broken. After thousands of years, the very best of human philosophers have all utterly failed to account for truth and the origin of human knowledge apart from God. In fact, the one most valuable lesson humanity ought to have learned from philosophy is that it is impossible to make sense of truth without acknowledging God as the necessary starting point. In more recent times, unbelieving intellectuals have admitted the chain is broken and decided that the culprit is the absurdity of any quest for truth. In effect, they have given up that pursuit as something wholly futile. The world of human ideas is therefore currently in a serious state of flux. On almost every level of society, we are witnessing a profoundly radical paradigm shift—a wholesale overhaul in the way people think about truth itself. Unfortunately, instead of acknowledging what truth demands and yielding to the necessity of belief in the God of truth, contemporary Western thought has devised ways to rid human philosophy of any coherent notion of truth altogether. The concept of truth is therefore under heavy attack in the philosophical community, the academic world, and the realm of worldly religion. The way people think about truth is being totally revamped and the vocabulary of human knowledge completely redefined. The endgame, clearly, is to usher every notion of truth into oblivion. The goal of human philosophy used to be truth without God. Today’s philosophies are open to the notion of God without truth—or to be more accurate, personal “spirituality” in which everyone is free to create his or her own god. Personal gods pose no threat to sinful self-will, because they suit each sinner’s personal preferences anyway, and they make no demands on anyone else. That fact underscores the true reason for every denial of truth: “Men loved the darkness rather than the Light, for their deeds were evil” (John 3:19). Here the Lord Jesus says people reject truth (light) for reasons that are fundamentally moral, not intellectual. Truth is clear—too clear. It reveals and condemns sin. Therefore, “everyone who does evil hates the Light, and does not come to the Light for fear that his deeds will be exposed” (John 3:20). Sinners love their sin, so they flee from the light, denying that it even exists. The war against truth is nothing new, of course. It began in the garden when the serpent said to the woman, “Has God said . . . ?” (Genesis 3:1). A relentless battle has raged ever since—between truth and falsehood, good and evil, light and darkness, assurance and doubt, belief and skepticism, righteousness and sin. It is a savage spiritual conflict that literally spans all of human history. But the ferocity and irrationality of this present onslaught seems quite unprecedented. The far-reaching ramifications of the recent paradigm shift are obvious already. Over the past generation—and especially the past three decades—we have seen convulsive changes in society’s moral values, philosophy, religion, and the arts. The upheaval has been so profound that our grandparents’ generation (and practically every prior generation of human history) scarcely would have thought the landscape could possibly change so quickly. Almost no aspect of human discourse has been left unaffected. The traditional, nominal devotion to ideals and moral standards derived from Scripture is dying with the senior generation. Many believe the paradigm shift marks the demise of the modern age and the dawning of a new postmodern era—the next great epoch in the development of human thought. Next time we’ll examine modernism, its failed demise, and how postmodernism filled that void with even greater errors in the quest for truth. Note: All comments must be approved before being posted. Email me when someone posts a comment. We value your comments, even your disagreements, as long as you are courteous and respectful. We’ll remove anything unwholesome. We appreciate comments that are on topic and contribute to the discussion; expressing appreciation is also welcome. We welcome comments from those who take responsibility for their posts. Comments from fake registrants will not be posted. Are You Getting the Most Out of God’s Word? 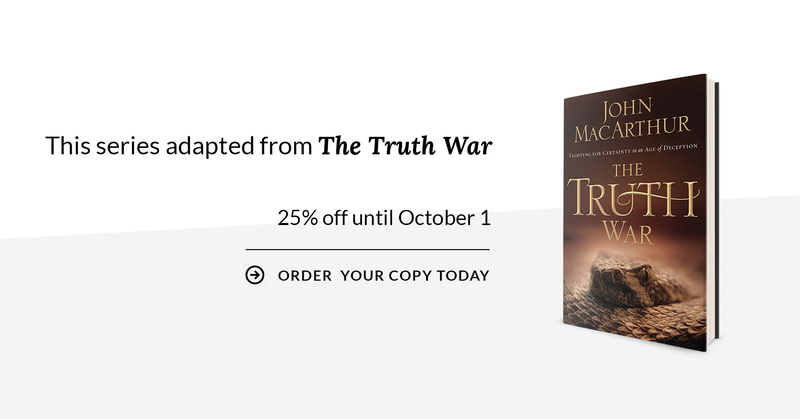 A Practical Booklet from John MacArthur—Yours Free!